Hurricane insurance coverage is vital to protect your home or business from the catastrophic damage that often results from hurricanes and other major storms, and Five Brothers Insurance can help you find the hurricane insurance policies you need to protect your interests before the storm hits. Our family-owned and operated insurance agency has been serving the personal and commercial insurance needs of Florida residents and business owners for decades, and in our many years of dedicated service, we have remained an independent agency, which allows us to provide you the very best rates from the world’s most reputable carriers. Since we don’t have formal partnerships with specific carriers, we are able to truly shop around for the very best hurricane insurance policies that best meet your needs. Hurricane policies can be of the utmost importance if you face a major storm or flood. Essentially flood and windstorm coverage, costs will depend on your property value, coverage requirements and several other factors. Flood Insurance: A Five Brothers Insurance agent can help you determine if your property’s flood zone makes you at high risk for floods during storms and hurricanes. If so, we can find you an affordable policy that will help keep you covered if the worst does happen. 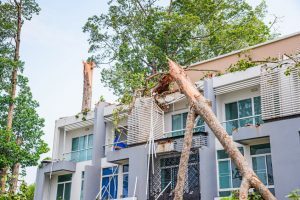 Windstorm Insurance: A separate windstorm policy is ideal for those in coastal areas, since those are the regions that are most at risk for hurricane-force winds. Even winds from tropical storms can wreak havoc on roofs and structures. That’s why we recommend both a flood and windstorm policy for complete hurricane coverage. If you are interested in learning more about hurricane insurance coverage for your property in Tampa, Clearwater, St. Petersburg, Orlando, Altamonte Springs or elsewhere throughout Florida, contact us today for more information or to request quotes. We are the insurance experts, and we look forward to serving you! © 2019 FIVE BROTHERS INSURANCE. All rights Reserved.